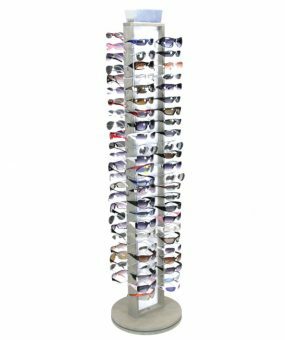 Our SU-120LINK-10 spinning sunglass display is one of our top sellers in our signature LINK SERIES line of retail sunglass fixtures. 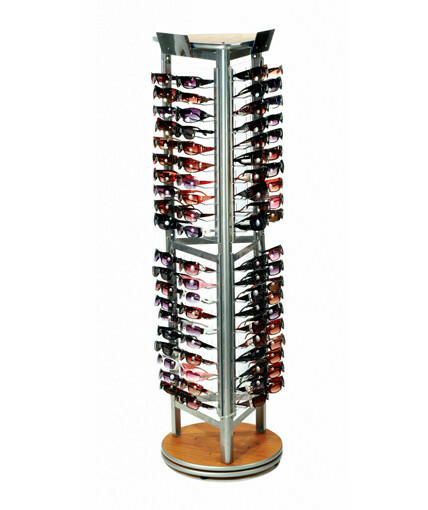 Unique among eyewear displays, the SU-120LINK-10 holds 120 glasses, features a shiny silver frame, anodized aluminum panels, chrome nosepieces, clear PVC panel eyewear management system, 1 glass mirror, a crown with interchangeable header graphics, and an MDF base with a cherry finish. 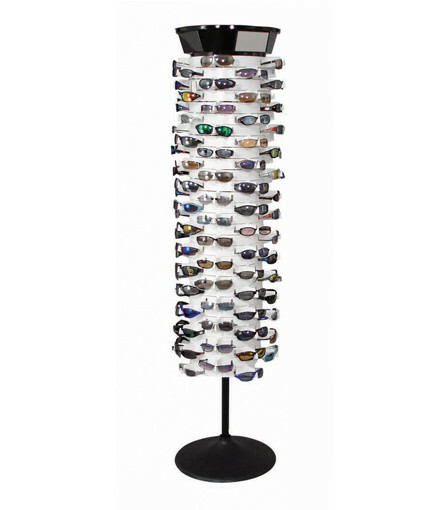 This sunglass display fixture accommodates a wide range of frame sizes, features a knock-down design which facilitates lower shipping costs, and is easy to assemble. Its small footprint is space-efficient and works well in almost any retail setting- from convenience stores, grocery stores, and sporting good stores to mass market retail, specialty retail, car washes and gift shops. 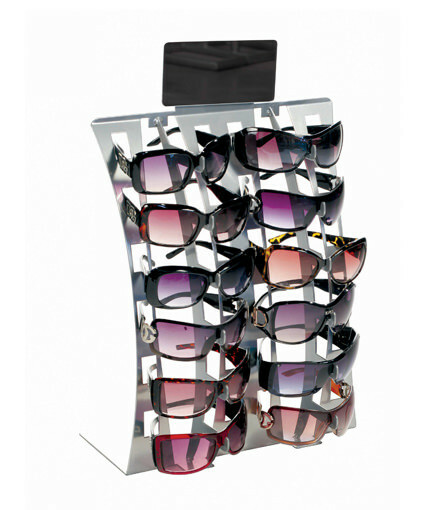 The SU-120LINK-10 is time-tested and has been one of our most popular retail sunglass fixtures. 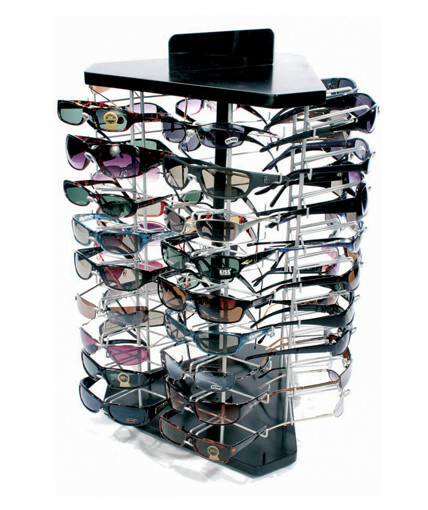 The units clear PVC eyewear management system makes it easy to keep the glasses organized, and the unit is extremely easy to maintain and service, particularly compared to other retail sunglass fixtures on the market. Its durable construction and quality craftsmanship also make the SU-120LINK-10 stand out in the marketplace. 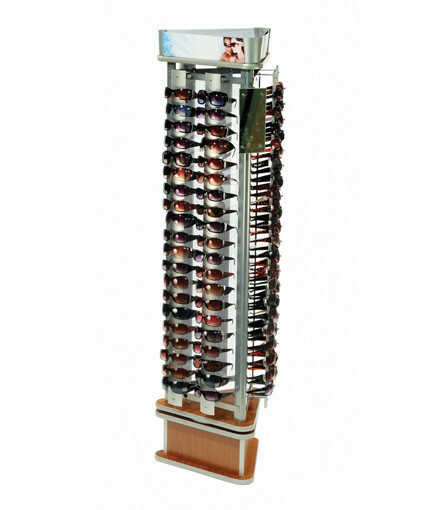 If you are in the market for a sunglass display case or a spinning sunglass display and your goal is to sell more sunglasses and increase the perceived value of your product, the SU-120LINK-10 is a smart choice.